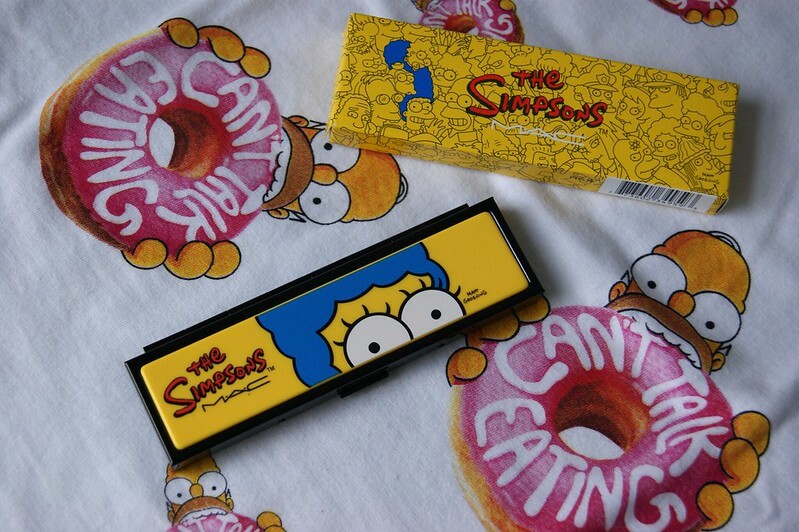 SHARK ATTACK - FASHION BLOG: Give Away // The Simpsons & MAC "Marge's Extra Ingredients Quad"
Give Away // The Simpsons & MAC "Marge's Extra Ingredients Quad"
Here we are with an exciting give away again! 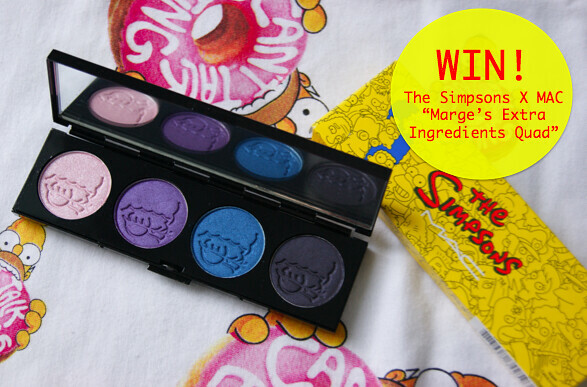 Shark Attack - Fashion Blog is giving one of you the chance to win the Marge's Extra Ingredients Quad from the highly anticipated The Simpsons & MAC collection. The quad contains four gorgeous colors, from a bright baby pink to a darker blue. When I saw the first press releases, I immediately fell in love with the Marge's Extra Ingredient Quad. So, at the event, I just had to get my hands on it. As soon as they told us that the collection was available for sale, I rushed to one of the saleswomen and told them that I wanted the quad. I was afraid that it would be sold out in a heartbeat, which is why I didn't take the time to take a proper look at it. For the past couple of days, I've been wanting to create a look with the eye quad. But, after having the chance to look at it decently, I came to the conclusion that the colors just aren't exactly my thing, especially the blue one. Don't get me wrong, I think this is a gorgeous quad, but I have the feeling that (except for the bright pink) the colors would look better on someone else. It's just a shame to leave this quad hidden in a drawer somewhere, only taking it out to use one single color from time to time. And, since I know that not all of you had the chance to purchase something from the collection AND since my blog will turn 5 years old in October, I thought it would be the perfect opportunity to celebrate this special birthday as a gesture of my appreciation. So, that's the story behind it. I still have a blush and a lipgloss from the The Simpsons & MAC collection (which are both approved 100%, lol), so it's OK. I do want to make clear that I purchased this quad myself (so it is not a press sample) and that I never used it (not even for swatches). It really is brand new. 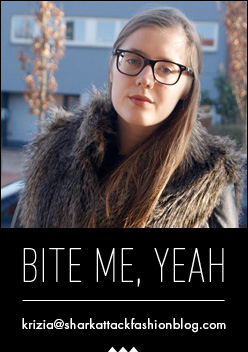 * Follow my blog on Bloglovin'. * Like Shark Attack - Fashion Blog on Facebook. >> Please make sure that the name you put in the comment box matches with your Facebook-name, so that I can check. * Follow me on Instagram. >> If you did, also leave your username in the comment, so that I can check. The give away is open worldwide and will end on Thursday, 25 September 2014. I will announce the winner on my Facebook-page. Hey Krizia, super leuke give away! Tasting Lifestyle is een trouwe volger via bloglovin' en via facebook! Veel succes nog met de give away! 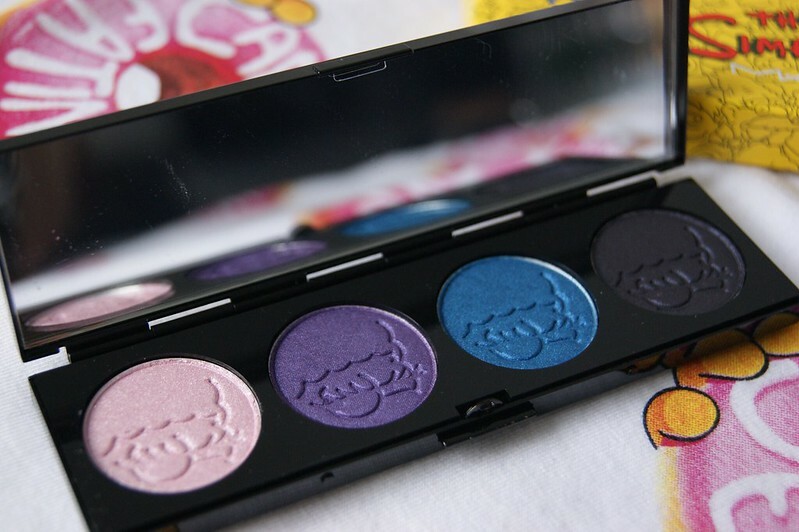 I read from another blogger who really wanted this palette but ended up getting the greeny one that this one was a bit too crazy of colors for her too. But I think I can work with them, I love blues and purples and this collection won't be launched where i live unfortunately :'( So I'd love it if I can get my hands on them! i have liked you on FB, followed you on bloglovin and insta! I'd love to win this wonderful prize! Zo cool! Ik hou na zoveel jaar nog steeds van de Simpsons en vind deze collectie dan ook geweldig! Ik doe graag mee, heb zo'n kleurenpallet nog niet in mijn collectie (en ook gewoon omdat ik het doosje wil hebben, let's face it :D) ik volgde je al overal! Superleuke winactie! Ik doe graag mee :). Ik heb je gevolgd via Bloglovin' en je FB pagina geliked (Anneloes Debets), en ik volg je nu op instagram! (@beautycloudnl). Mijn e-mail is: anneloes_x @ live.nl (even wat spaties erin om spam tegen te gaan ^-^). Mijn vorige reactie ging verloren, tweede poging! Ik volg je op alle kanalen, volgens mij ook al 5 jaar. Man, dat vliegt! Dit palet van mac heeft zo'n hoog 'hebben' gehalte. As I am not a fan of the packaging I'm skipping this one. But good luck to everyone who's entering! Hoi! Ik volg je overal :D Op instagram onder de naam kmbrlee_beyoutiful. Super toffe winactie!! De verpakking is zo cute dat die echt een aanwinst is voor je collectie. De kleurtjes zijn natuurlijk ook prachtig. Leuk om mee te variëren en tot een prachtige look te komen. Oh wat leuk, deze actie! Ook echt leuk dat het van jezelf is en niet gesponsord! Oeh oeh oeh, ik doe mee! Heb al het nodig gedaan en m'n e-mailadres is birtegovarts@hotmail.com :-). Ik doe graag mee! Ik volg je op alles (mijn insta is insins). Wat super lief van je dat je hem weggeeft! Helaas zijn het ook niet mijn kleuren, met name de blauwe inderdaad maar ik wens de rest wel veel succes! HA! What a cool idea for a palette. Ik vind het palette echt heel gaaf en doe dus graag mee. Ik volg je nu overal (Instagram = @ILUMUOTI). Nice post, the colour of the palette is very lovely!! This looks really nice! Love the simpsons make-up! Oooh wat een geweldige give-away, count me in! Ik doe mee! Ik heb alles gedaan en heb overal dezelfde naam, namelijk Ypie, op instagram is het Ypiie. Superleuke give away! Mijn e-mail is: Ypiespeedy2@hotmail.com of oh-saycanyousee@hotmail.com. mijn emailadres is danaivorgia@hotmail.com en mijn instagram is ook gewoon danaivorgia. Just followed you on your social media! not just for the contest but your blog is great!! Ik snap je volledig. Echt een tof palet, maar die kleurtjes... ik weet niet of m'n bleke velletje ze aan kan. Ik heb een van de make-up artists wel een look met deze zien maken op de Mac opening en was echt blown-away! Maar ja, die skills ontbreken met toch. That's so cool! I remember watching The Simpsons when I was growing up! I haven't heard about this collaboration but it's definitely something I'll be looking into!